Winston, Harold Julian, died December 19, 2011 at home, where his family kept a bedside vigil for the six weeks of his illness. He often said, "Every day past three-score and ten is a gift." We are grateful for twenty-two years of gifts for this man who lived his days as if every breath was a gift. For over 69 years, he was the devoted husband of Rebecca Salky Winston. Father to Jerry M. (Lisa), Larry I. (Barbara), Barry A. (Annette), all of Knoxville, and Susan R. (Mark Young) of Memphis. Grandfather to Trent, Brett (Kelly), Johnathon (Jessica), Andrea, Samuel (Lea) and Alexander (Jessie) Winston, Robyn (Kozaburo) Tomioka; and Jennifer, Margo and Winston Young (Suzy's). Great-grandfather of Gaia, Braden, Jack, Noah and Ruby with another great-grandchild due in February. No one who married into the family was allowed to call themselves "in-law". To him, all of us were his children or grandchildren. He also leaves a number of nieces, nephews, and great-nieces and nephews, and dear friends, Regina Evans and Rabbi Howard and Rona Simon. He was born in Richmond, Virginia on November 19, 1919, and was the son of Henry Weinstein and Bessie Rolnick Weinstein. His sister, Leona Weinstein Kessler, predeceased him in July of this year. A 1941 graduate of the Southern College of Optometry, he established practice in Knoxville in 1942, and inspired two sons and one grandson to follow in his footsteps. He had the joy of joining his son onstage at his alma mater to present his grandson the Doctor of Optometry in May 2011, ensuring a third generation to carry on the practice. All four of his children worked in the practice at some point in their careers. He was proud of all of his children and grandchildren and everyone who knew him knew that he devoted his life to the happiness of his family and home, to wisdom, service to community, integrity, and enterprise. He was a member of the American Optometric Association and the Tennessee Association of Optometric Physicians, and a Fellow of the Tennessee Academy of Optometry. He served as President of the Tennessee Optometric Society. He was an active member of Temple Beth El for all of his married life and held every office there, including serving as President twice and chairing the Building Committee for the current location. 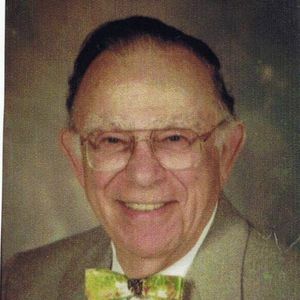 He was an active member of the Arnstein Jewish Community Center, serving in every office, including its President and as Chairman of the Building Committee of the present location. He also was active in the Junior Chambers of Commerce, where he served as an officer and Honorary Vice President, was President of two Lions Clubs, and was active in the Democratic party, even running for State Legislature in the early 1970s. People all over Knoxville who knew him will remember him for his ready smile, his gentle touch, his caring nature, and his Werther's original candy, which he gave to everyone he encountered every day. A memorial service will be held at 2:00 PM on Wednesday, December 21, 2011 at Temple Beth El with Rabbi Beth Schwartz officiating. Burial to follow at New Jewish Cemetery. Pallbearers are his grandchildren. The family requests that memorials be made to Temple Beth El, 3037 Kingston Pike, 37919; the Arnstein Jewish Community Center, 6800 Deane Hill Dr., 37919 or to the American Cancer Society, 871 Weisgarber Rd., Knoxville, TN 37909. Online condolences may be sent to www.rosemortuary.com. Arrangements provided by Rose Mortuary Mann Heritage Chapel. We extend our Sympathy to Harold's family. Harold was a long-time client of ours and neighbor at Olde Gatlinburg Place. We will miss his smile and his "candy". Each time he came to our office was a pleasant visit. Harold was a fine man who enjoyed life and shared that joy with everyone. Deepest sympathy. Doc Winston will be greatly missed by all his friends from Olde Gatlinburg Rentals and the SIdney James Mountain Lodge. The Patterson an McCarter, send our condolences to the entire Winston family. His smiling face will be missed, but never forgotten. Please accept my condolences on the loss of your dad. His smile and charm will be missed by all. To all the Winstons, I am so very sorry for your loss. I had the privilege of working with you all 30+ years ago. I had just recently reconnected with the practice and got to see Dr. Harry in person. PLease know that you're in my thoughts. He was a wonderful man. Harold will be long missed. Always a smile, always and handshake and always friendly. We are proud to have known this kind neighbor. Our family has lost a loved one who has been with us through every phase of all our lives. Dr Winston began at my parents wedding in 1950. He was a dear Friend to the Gudis/Taylor family and attended every occasion that was held for 60 years. My parents consider He and Becky their best friends in the world. My father had his best days of fun, card games and sporting activities with Dr Winston. No one has my Dads respect more than he did. My Mothers love for Becky is like one of a sister that she never had. The Winston Family is the true meaning of Jewish Family. Our prayers of peace and love to all that are effected by this great loss, to everyone he meet and cared for we care for about you. Thank you God for Harold Winston as our family would have not been the same without his love and respect. All our thoughts go to the children and grand children that carry the Winston name forward with the highest respect. Rest in Peace for the good deeds you performed. What a friendly smile and a warm handshake to a scared rookie Optometrist at his first convention thirty-seven years ago which now seems like only yesterday. At every convention or meeting since that day, he always made me feel like I was one of his boys. God bless you Jerry and Barry, there's a whole bunch of us guys out here that loved him too. So Sorry to here about your Dad. He had brought so many smiles to so many.